As we compared various electric wine openers, we found one thing was true – each one claims to open wine bottles effortlessly. Comparing the options on the market led us to believe some outranked others and let us start sipping our glass of cabernet with friends much sooner. Our pick for the best electric wine opener is the Oster Cordless Electric Bottle Opener with Foil Cutter. Featuring a long-lasting battery, this kitchen gadget will continuously open bottle after bottle before you have to place it back on the charger. Get to enjoying your glass of wine quickly with this countertop wine opener. It opens your vino with little effort in a matter of seconds. 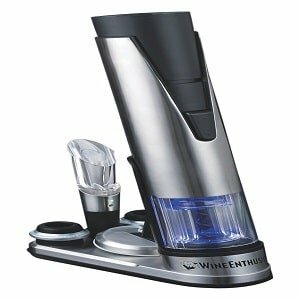 What Are the Top Features of the Best Electric Wine Openers? 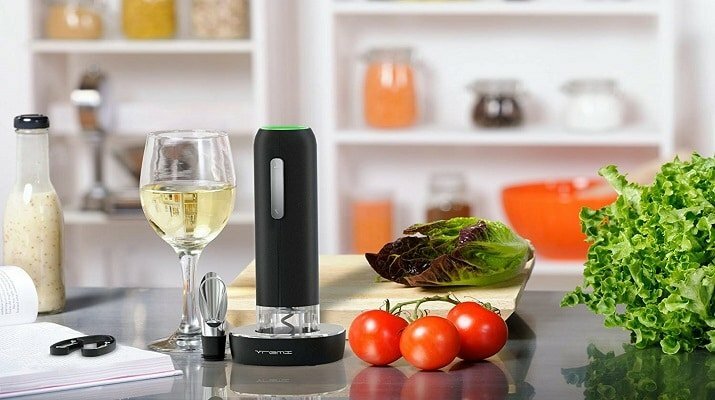 When you’re in search of an electric wine opener, certain features stand out among the rest as both useful and beneficial when compared to other options. You’re not able to open both synthetic and natural cork with all wine openers. An opener that allows you to do both is convenient and diverse. It alleviates the need to have any other corkscrew besides it. Some of the top countertop wine openers come with a feature that seals the bottle closed to preserve it. This helps protect the freshness and flavor of unfinished wines, so you can continue to enjoy them just as they were meant to be enjoyed. Stainless steel anything is usually built sturdy, so you can use the item for years to come without any issues. Generally, stainless steel takes a long time to rust. In some cases, it won’t rust at all because the alloys found in it tend not to react with the environment. You also don’t have to worry about it tarnishing, so it looks amazing each over time. While not every automatic wine opener has a battery, the ones that do are extremely convenient since you don’t have to deal with the cord when you’re opening a bottle of wine. When comparing your options, you want to choose one that has a battery that lasts quite a few hours. Generally, you’ll notice the specs state how many bottles you can open before the battery must be recharged. This number is sometimes as high as 80 bottles. Cordless is just convenient. You can open the bottle anywhere you want and not have to worry about being near an outlet. You also don’t have to worry about the cord getting in the way as you’re opening. Getting the foil off wine bottles is a nuisance, but purchasing an automatic wine opener that has a foil cutter decreases the stress and time it takes to sample a new wine or enjoy a classic. It’s also more cost-efficient since in some cases, you have to purchase a foil cutter that’s separate from the wine opener. Speed is another option you want to consider when purchasing a kitchen gadget of this nature. You want something that opens up bottles quickly without much room for error. Wine openers with ergonomic grips are easier to use. They fit comfortably in your hands and don’t feel overly bulky. Not all automatic wine openers are created equally. It’s important to view the specifics about each one you’re interested in and do a comparison. 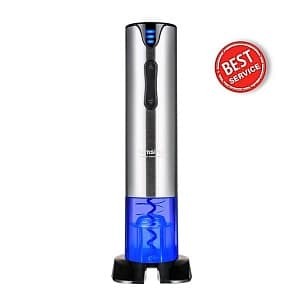 One factor you want to consider when choosing the best electric wine opener for you is the brand. Although choosing a reputable brand usually means you pay slightly more, it’s often beneficial because the product is known to last and work well. Unless you plan on placing your electric wine opener on the charger after each use, an important factor of choosing an electric wine opener is the battery life. Most of the time, the specs include the number of hours the opener lasts as well as the number of bottles it will open before it needs to be charged. Speed should definitely plan a role when you’re choosing an automatic wine opener. If the process isn’t speedy, you’re really not benefiting from having an electric wine opener. If it’s slow, you’re just spending more money than it would cost for a standard corkscrew. You’re not saving yourself any time if the product isn’t fast. Although most battery operated wine opener products won’t disclose the exact amount of time the opener will last before you must charge it, you can kind of get an idea by how they advertise the speed as well as the reviews. When you’re choosing a kitchen gadget like an electric corkscrew, you want one that you can move around easily. This is important for two reasons; one is you want to be able to clean it and underneath it easily. The second reason is that you want to be able to grab, use, and put it back quickly. Although it’s not a main reasons why portability matters, smaller, lightweight automatic wine openers are easy to take with you if you should happen to need it for a party or other gathering. 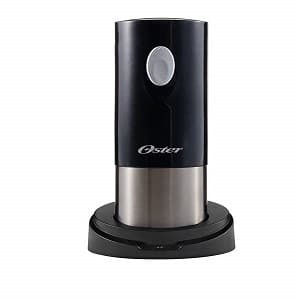 The Oster Cordless Electric Bottle Opener rates as the best overall electric corkscrew because it opens a wine bottle in seconds, eliminating the frustration of wanting a glass of wine now. You won’t need to order an addition apparatus to open your favorite vintage because it comes with a foil cutter. It’s extremely easy to use. You merely place it on top, and it does the work for you with just a push of a button. It’ll take very little effort to get the cork out of the bottle. You’ll get about 30 bottles of wine open before you’ll need to recharge. Once you place it on the charger, it doesn’t take long at all to charge. Even if it’s completely dead, it takes about six to eight hours to fully charge. After it’s done, the indicator light alerts you. You’ll like that it’s lightweight and portable since you can move it to clean or take it with you. The comfortable grip made it a breeze to use, and it’s an ideal size — not too clunky or awkwardly small. We should mention it looks stylish and blends in with most decors. When you compare this battery operated wine opener with others, you’ll like that it’s lightweight and portable. You’ll like how well it works. However, the downfall of this wine opener is that it’s only geared toward a standard bottle of wine, so if you have any unusually bottled wines, you might find this one won’t meet your needs. What You’ll Love: Works quickly, elegant styling, and comes standard with a foil cutter. This Secura electric screwdriver rated as our top pick for the best budget opener since it’s reasonably priced and works considerably quick. We felt it worked very accurately and efficiently. Truthfully, you would never suspect this is a reasonably opener by how quickly and reliably it is. It has a stainless steel housing along with a black base, so it fits in well with most decor. You’ll be surprised to know you won’t have to charge this for a while after a charge since it opens up to 30 bottles before it dies. Overall, this product is very simple to use. All you have to do is push one button on this automatic wine opener before it starts to work instantly. Once it begins to work, it takes very little effort on your part. We found it very convenient that it comes with an easy-to-use foil cutter. It works extremely quick, which works really accurately so you’re not fussing with the foil. We like that this kitchen gadget isn’t large, so you shouldn’t have any trouble finding a home for it. You can use this automatic wine opener on artificial, composite, or even natural corks, making it very diverse. You shouldn’t have to purchase any other corkscrew since it works on any type of cork you’ll come in contact with. We found that this automatic wine opener had way more pros than cons. It does, however, only open bottles that have a traditional styling. We’re not quite sure how long it’ll last year, considering we only tried it out for a short duration of time. What You’ll Love: made by a reliable brand, has stylish appearance, is lightweight, and opens bottles effortlessly. 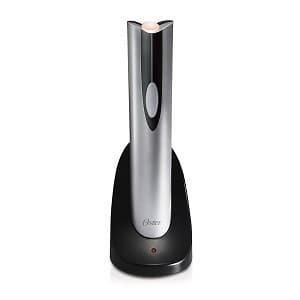 It’s no surprise that a second electric corkscrew from Oster made the list. This is a very reliable kitchen gadget company that makes various other items like blenders and has been doing so for quite some time. The outer styling definitely grabs your attention as soon as you look at it. You notice a balance between the silver and black. The contrast gives your kitchen gadget a voguish look that’ll blend well with a majority of kitchen styles. It comes with its own foil cutter, which is another benefit of its design. It’s convenient whether you’re hosting a dinner party or drinking alone. This particular countertop wine opener is lightweight, weighing in at only 1.63 pounds. You can move it from one to another easily or even take it with you when you need. You can open bottle after bottle with ease using this battery operated wine opener. It doesn’t require any effort on your part besides holding it in place. Then, it does the job in a matter of seconds. Open the bottle, and then you can immediate get back to entertaining. In fact, it even has a cork discharge feature that ensures the cork is off completely. And you only need to push the button to get it to turn on and start opening the bottle. If you’re one of those people who just place things on the charger quickly, you’ll be happy to know this device lights up when it’s actually charging. Plus, you only have to charge it after every 30 uses. When you’re considering the pros and the cons, you have to take into consideration that it keeps a charge for up to 30 uses. It has an attractive look sitting on a countertop or bar. Plus, it comes with this own foil opener, and it’s lightweight. On the other hand, this automatic wine opener only opens traditional wine bottles, so you’re limited on which vintages you can use it on. The unique color of the Lumsing Wine Opener Electric Rechargeable Corkscrew Wine Bottle Opener Battery Operated With Foil Cutter catches your eye as soon as you see. It’s a very efficient opener. It removes the cork on a bottle of vino in seconds without any hesitation. In fact, it conveniently opens a bottle of wine in less than eight seconds. It’s very quiet when it works too. Not to mention, it’s very easy to work. All you have to do is push a button, and it does the work for you. Most of the body of this automatic wine opener is comprised of stainless steel, so it’s made to last. Since a majority of wine bottles with corks have a traditional style, this one is ideal to use on a majority of wine bottles. This countertop wine opener has a built-in rechargeable battery that opens up to 45 bottles from just one charge. Fortunately, it has a battery indicator to let you know when you have to recharge it. It uses a USB charger that comes with the device when you order it. I was pleased to discover that it didn’t break any of the corks I used it on, whether they were synthetic or natural. 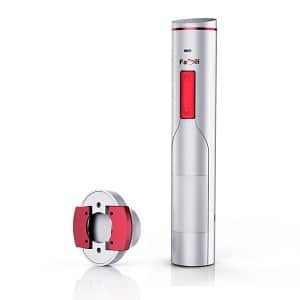 There are plenty of pros to purchasing this automatic wine opener including its unique color. Some may not like that it has a blue bottom, especially if it’s in your kitchen. We’re not quite sure how long this device continues to work. It was difficult to choose the best, so this category received two winners, one being the Famili FM700WR Electric Wine Opener Rechargeable Corkscrew Wine Bottle Opener with Foil Cutter. The pearl white shine with the red accents make this wine opener really pop. This battery operated wine opener can open up to 180 bottles before it needs to be recharged, which is quite impressive. It runs off of a Tesla Type rechargeable lithium battery. To operate it, you just push one button. It requires very little effort on your part. This electric wine opener works quickly. It took seconds to open a bottle of wine when we tried it. We think it would be ideal to use if you’re hosting parties and require a battery operated wine opener to open more than one bottle of wine at a time. It also comes with a foil cutter. It only weighs 1.3 pounds, so it’s extremely lightweight. I find that made it really easy to take it off the charger in the kitchen on the counter and use it in the dining room. Best of all, its compact size makes it easy to store, whether you want it on your counter or in your cabinet. Once you place it back on the charger, it recharges quickly. The pros on this battery operated wine opener range from a long battery life to a unique style. We’re not really sure how long the high performance of this device will last. It did break one of the corks on a bottle of wine we used it on. What You’ll Love: comes with aerator pourer and two vacuum stoppers has a foil cutter and opens up to 80 bottles before needing new batteries. Enjoying wine is more than just opening a bottle, and this set has everything you need for professional pouring including an aerator pourer. It comes standard with two vacuum stoppers to ensure your bottle of wine remains fresh for next time. It has a foil cutter as well. Because of the additional pieces besides the automatic wine opener, you can open any type of bottle including beer and champagne. You’ll need to use AA batteries in this opener, but you can open between 60 to 80 bottles with it on just one fully charged set of batteries. The electric corkscrew itself is lightweight and easy to move to where you want it. The aerator pour ensures you poor every glass without spilling. When we compared other wine opener sets to this one, we couldn’t find another one that offered as much as this one; that’s not saying there isn’t one out there. The vibrant blue color gives it a unique, modern look. The automatic corkscrew was exceptionally fast. With just a push of a button, it took four seconds to remove the cork. The pros of this kit include coming standard with everything you need. The shade of blue was quite interesting. On the other hand, this is a battery operated wine opener that requires you to keep changing the batteries. You may be able to use rechargeable batteries in it though. This kitchen gadget is ideal for people who don’t pour professionally but either love wine or host parties frequently. The electric blue color of this automatic wine opener stands out. It comes with a foil cutter, alleviating the need for you to buy a separate device. The foil cutter works well, very accurately and effectively. The corkscrew not only opens your bottle, but it also preserves it using the vacuum seal feature. When you buy the gift set, it comes with an aerated pour to prevent spills. The device fits conveniently into the charger, and the LED indicator light lets you know it’s charging. After you place it on the charger, it doesn’t take long to charge, although we didn’t time it exactly to figure out how long it took. We should mention it doesn’t take much effort on your part to use this battery operated corkscrew. Once you push the button, it does the work for you. It does the work remarkably quickly too. I have to say the opener is sophisticated looking with a hint of pizzazz with the blue. The pro of this is that it comes with a complete set including an electric corkscrew and a pourer. 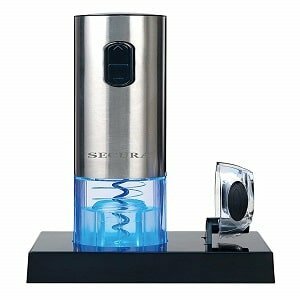 It has a blue light and has the ability to open numerous bottles before it needs to be charged. It isn’t a perfect set though. When you initially look at this automated wine opener, you’ll notice it has a simplistic design. Much of the piece is solid black with a clear bottom. However, it illuminates blue, which makes opening a bottle a bit more interesting. I found myself preoccupied with it lighting up blue as I used it. The blue light also illuminates as it charges, which makes for a neat night light. The black and clear of this electric corkscrew is easy to blend in with the rest of the kitchen gadgets on your countertop, even if all of your appliances aren’t black. It holds a charge for quite some time after you remove it from the charger, so you can open quite a few bottles before it absolutely needs to go back on the charger. It doesn’t take long to fully charge either. We liked that this automatic wine opener was easy to use. It started working with the push of a button, and then it effortlessly removed the cork. Many countertop wine openers merely get the screw part into the cork, and then you’re left doing most of the work to remove it. This one isn’t like that though. It did, however, work well getting out corks that seemed to be a bit more stuck than others. It works with little effort on your part. It has a simple style that matches most décors. Plus, it has a blue light. However, we found it worked better on natural corks than it did on synthetic ones. It’s best suited for standard sized and shaped wine bottles though. The Ivation Wine Gift Set has everything you could possibly need to open, pour, and enjoy a glass of wine. 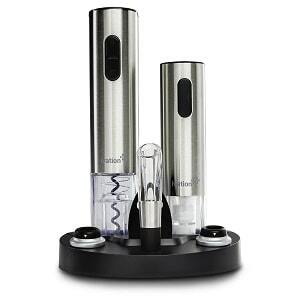 It has an electric corkscrew extractor, so it not only penetrates into the cork. It’s very simple to use. All you have to do is push one button, and it starts doing its job. It’s made of stainless steel, so you know it’s going to last without rusting. This stainless steel automatic wine opener is conveniently sized, so if you wanted to store it in your cupboard. You more than likely could find the space. However, its stylish appearance is great to enhance your kitchen, and it blends in with most other styles of appliances. This battery operated wine opener’s charge lasts awhile — 30 bottles to be exact — before you need to place it on the charger. When you position it on the dock, the LED light turns on, so you know it’s actually charging. It comes standard with a vacuum preserver. Therefore, once you’re done sipping, you can reseal the bottle and keep it fresh for next time. You can date-stamp the stoppers, so you know when it’s time to discard the bottle. The gift set also comes with an aerator to prevent spills and preserve flavor. It comes with a foil opener, and it works incredibly well. This gift set has everything a wine lover could ever ask for. We’re not quite sure if the vacuum preserver actually works, which is the only con to this set. What You’ll Love: comes with an aerator and vacuum sealer, can open up to 30 bottles, and removes cork easily. This is yet another automatic wine opener set that has everything you could ever need as a wine enthusiast including an aerator and a foil cutter. You can even vacuum seal the bottle when you’re done. This battery operated wine opener comes with a charging dock. It doesn’t take long to charge. Once it has a full charge, you can open about 30 bottles of wine before you need to place it back on the charging dock. You’ll always know when it’s ready for another charge because it has a red light that shines. Once you put it on the charging station and it charges completely, it’ll light up green. The electric corkscrew is very easy to use. With just a push of the button, the screw part goes into the cork. Then, it removes the cork totally. It’s made of stainless steel, so it’s designed to last. The outer coating is black, so it’ll give your counter or bar a classy look. It lights up green, so it’s a bit different than the other corkscrews on this list. It has a non-slip coating, so you should have no trouble using it. Use the aerator to enhance the flavor of your wine since it’ll breathe as you pour it. It comes with a foil cutter for your convenience. This product comes with an aerator and vacuum sealer as well as a foil cutter. It’s easy to use. We’re really not how sure this product lasts though.